Tomorrow is Yom Ha'Shoah, the day of remembering the Holocaust. The University of Southern California has a Shoah Foundation Institute. You could honor the day by making a donation, or by exploring the resources there. I will honor the day by re-reading the The Diary of Anne Frank, Why that? It was by reading the book that I learned that the Jews were annihilated in Europe. I know I was younger than she was when she wrote the book, so it was before 1964. It may have been assigned to my older sister, or one of my older cousins. 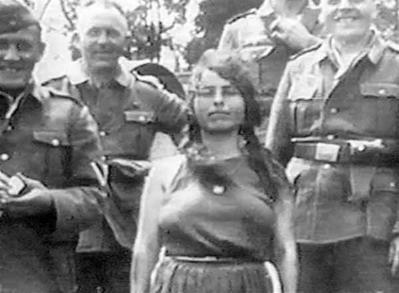 Roma woman with Nazi soldiers*; image source. My family, my ancestors, being American citizens for three to five generations before 1941, being not Jewish (that I know), being renegade Mormons in some branches, being otherwise Christian, didn't know anyone who died in the camps, let alone losing loved ones. My male relatives -- my father and uncles -- all served in the Navy or if in the European theater, were far from the camps. I also honor the day by thinking of those who opposed the Germans. *Don't forget, the Rom were subject to persecution before the Nazis came to power, but the Nazis were more efficient. The Nazis exterminated the Rom as well as the Jews.